The prime minister opened by talking about his recent meeting with Russian President Vladimir Putin and comments US President Trump made overnight Wednesday, calling him tough and smart. He argued that he and the Likud have made Israel stronger than ever before. "These connections are not to be taken for granted," Netanyahu said. "The Left knows they cannot compete with these achievements in the voting booth, so they put massive pressure on the attorney general to indict even though there is nothing, in order to influence the elections and put the Left in charge." 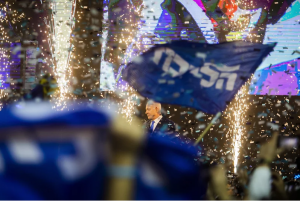 Netanyahu expressed confidence that most voters won't be influenced by the announcement, but said that even if it influences a few not to vote for him, it will bring the Left to power. "I've never seen the Left so happy...They're sewing suits" to wear because they expect to become ministers, Netanyahu said. As for the timing, 40 days before the April 9 election, Netanyahu said "every citizen knows this is outrageous and meant to bring down the Right. "I am not being given the chance to disprove [the accusations] until after the election - and I will disprove them all," he added. Prime Minister Bibi Netanyahu won re-election for a fifth term.